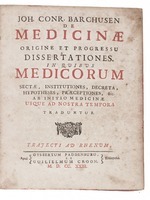 De medicinae origine et progressu dissertationes. 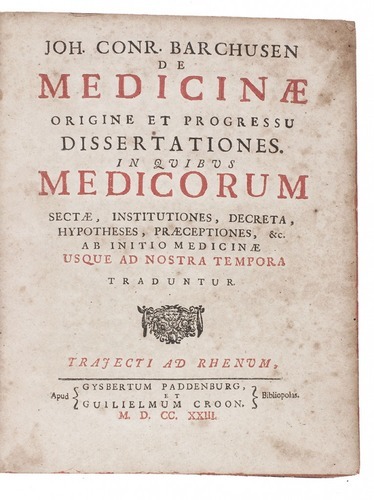 In quibus medicinorum sectae, institutiones, decreta, hypotheses, praeceptiones, &c. Ab initio medicinae usque ad nostra tempora traduntur. 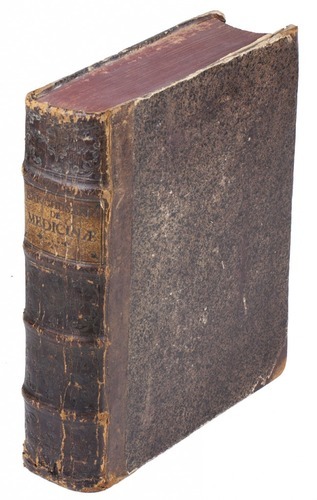 Completely revised edition of a collection of 26 texts on the history of medical and chemical theories by an expert on medicine and chemistry, Johann Conrad Barchusen (1666-1723). Between the examined authors are Paracelsus, Crollius, Van Helmont, Fludd, Campanella, etc. Pp. 333-63 are devoted to Chinese medicine, or acapuncture. Barchusen studied pharmacy at several universities, including the universities of Berlin, Mainz and Vienna. He settled in Utrecht in 1694, and after being awarded an honorary M.D. by the city in 1698, he was appointed extraordinary professor of chemistry in 1703. Barchusen's work shows his development from a practicing pharmacist to a professor of the new academic discipline of chemistry. His first book Pharmacopoeus synopticus, published in 1690, was a pharmaceutical work. After his arrival in Utrecht, he published a further three works on chemistry. Although Barchusen was not a chemist of genius, his activities much contributed to the high level of the Dutch academic chemistry from which his illustrious contemporary at Leyden, Hermann Boerhaave, emerged as the most influential teacher in the first decades of the eighteenth century. The first edition of the present work was arranged in dialogue form, which was criticized heavily, together with the poor Latin style. Therefore, in 1723, the present revised edition was published as a respond to these criticisms. Ferguson, Bibliotheca Chemica I, p. 72 "an interesting collection of essays"; Blake, p. 99; Neu (Ed. ), Chemical, Medical, and Pharmaceutical Books Printed before 1800 in the collections of the University of Wisconsin Libraries, 230; DSB I, p. 450-1; this title not in Cole, nor in Bibl. Med. Neerl.